Phil went to Sabkhat Al Fasl as normal on Friday and although the weather was poor, cloudy and overcast with rain, he managed to see a couple of really good birds. 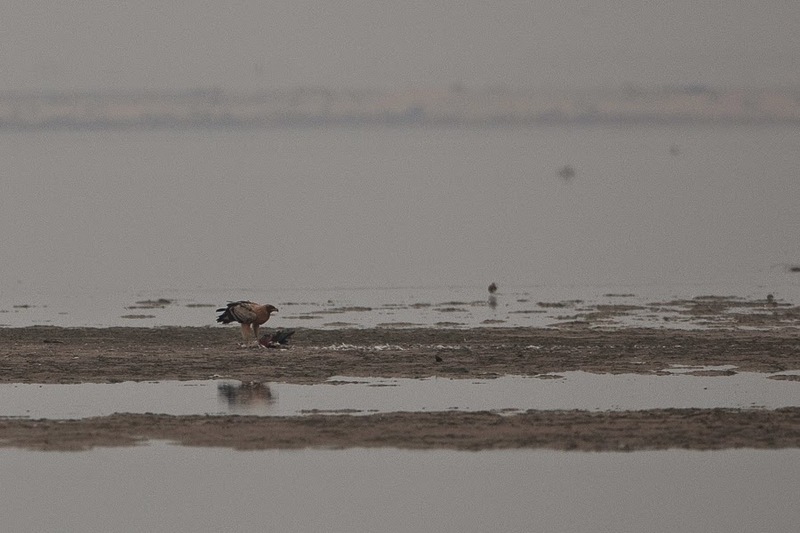 Probably the best was a fulvescens Greater Spotted Eagle, as this colour type is very uncommon making up a maximum of 3% of the birds seen in the Middle East, where it is more common than in any other area where it occurs. When you think how uncommon the species is on a world scale there are not that many fulvescens about worldwide. Phil said he had distant views of the feeding on the Sabka and the light was really bad so the photos are not that good, but he has kindly allowed me to use one on my website. Hopefully this bird will hang around for the winter and allow better photographs to be taken of it. The other good bird Phil saw was a White-throated Kingfisher, which is the first of the autumn but it flew off before any photographs could be taken of it. This species was a vagrant to the Eastern Province of Saudi Arabia until a few years ago but it is now a scarce winter visitor.